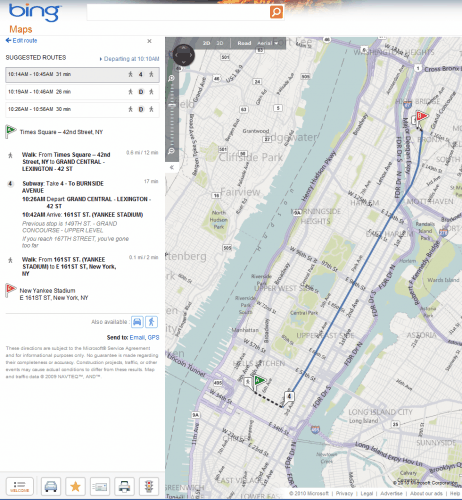 Bing Maps until recently only offered driving and walking directions for users of the maps service. Today the team announced that they have expanded this by adding transit information for 11 US American and Canadian cities to the information already displayed. While eleven may not sound like much, it is a solid start and the developers have already confirmed that they will be adding additional cities in the future. Currently, the following cities are supported on Bing Maps: Boston, Chicago, Los Angeles, Minneapolis, New Jersey, New York City, Philadelphia, San Francisco, Seattle, Washington DC and Vancouver. Transit information can be displayed by adding two supported locations in the From and To fields, and selecting the Transit symbol afterwards on Bing Maps. Calculations take a few seconds the most and display suggested routes to the user of the map service. Transit information include walking information to reach the destination. Options are provided on the screen to receive car and walking directions as well, to compare those without much effort. Directions can be send to email or GPS as usual in the end. The transit information are very US-centric at the moment, and it is not clear when and if cities from other parts of the world will be added to the service. Google's Transit service is currently supporting more cities than Bing Transit. That on the other hand seems natural, considering that their service started a few years earlier. The information are similar for supported cities. Users who are living in one of the supported cities may find Bing's Transit directions useful. Everyone else may use Google Transit instead, or rely on the information provided by the local metro site. 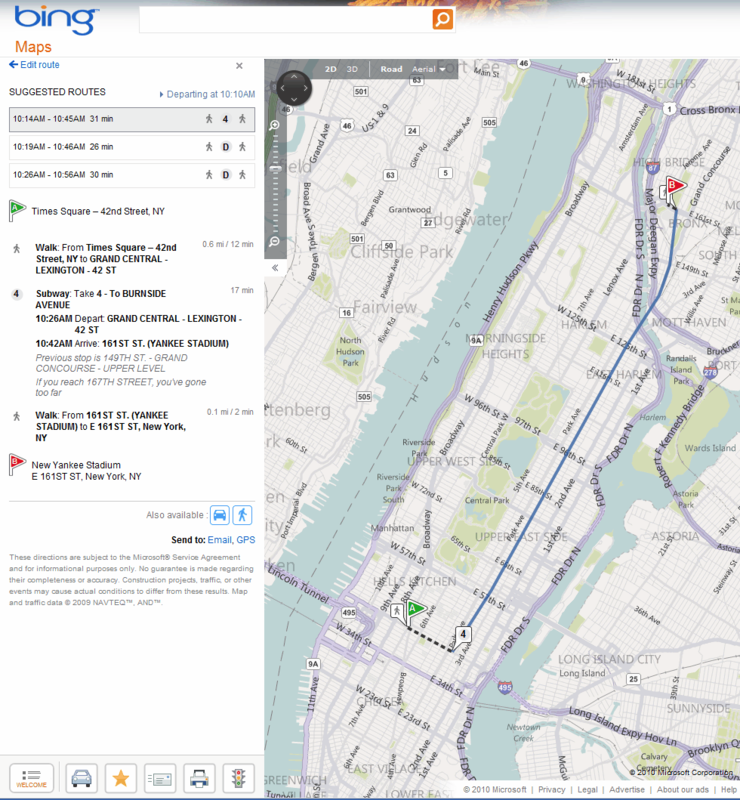 Interested users can check out Bing Maps on the official site.